This is part 1 in a series on designing great mobile apps. Make sure to check out parts 2 & 3! The best apps are those that are designed to shine in a specific moment of need. Unlike websites or billboards, which facilitate multiple use cases and are designed from the producer’s point of view, a successful mobile app is one that focuses on users’ needs at a specific time and place. Brian Wong is right when he says that the moment is the currency of engagement brands should be paying attention to. Want to share that awesome sunset? Tap Instagram. Trying to fill a few minutes? Tap Candy Crush Saga. Paying for your for coffee? Tap Starbucks. Need to get to a meeting? Tap Uber. Notice how specific these needs are? 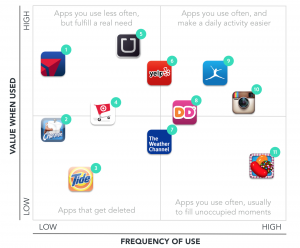 Broad-focused apps are increasingly fragmenting into more targeted use cases. Facebook’s general ‘interact with your friends’ use case is being assaulted by the specific offerings from Instagram (look at my friends’ current photos) and WhatsApp (instant message with my contacts). Given this, a branded app needs to have a laser-sharp focus on delivering a specific value to a user at a clearly defined point in time. The mobile apps that we engage with the most are the ones that provide the most value or that we use the most frequently. How your app rates on each of these dimensions will determine how actively users engage with it. Games can expect to engage users multiple times a day, something that a travel app just won’t achieve. Great apps for brands are those that tap into daily moments – filling time during a commute, making the morning coffee ritual easier, or sparking ideas for dinner. If a moment isn’t frequent, then the need it fills has to be significant. Most of us don’t travel every day, but when we do head to the airport, an airline app is so useful that it justifies a place on our phones. Flashlights filled a similar niche – you don’t need to use one often, but when you do, it’s enormously helpful. To illustrate our point, we’ve put together a matrix of well known apps – mapping each by frequency of use and overall value it provides – and our reasoning behind each mark. Fly Delta: Allows users to book and track flights. Though it’s only needed for booking and during travel, the app makes getting out of town much easier for Delta flyers. SitOrSquat: Restroom Finder: Helps people on the go locate public restrooms, and see cleanliness ratings from other app users. Unless you find yourself unable to locate a clean bathroom often, it may not justify space on your phone. Tide Stain Brain: Gives users step-by-step instructions for stain removal based on stain cause and fabric. Provides little benefit over and above a quick Google search. Cartwheel by Target: Allows Target shoppers to stack product discounts in a personalized barcode – and apply the coupons easily during in-store checkout. This app is great for frequent Target shoppers. Uber: Offers on-demand car service in cities across the globe. By offering transport that’s only a tap away and (almost) always available, Uber addresses a major pain point. Yelp: Helps people in new areas discover places to eat, drink, and explore (including ratings). You probably won’t need the service everyday, but find it indispensable when you’re somewhere unfamiliar. The Weather Channel: Provides users with the local forecast – by hour, day, and longer. As weather always changes many users check this every day. Dunkin’ Donuts: Rewards coffee drinkers for their loyalty, makes paying easier, and allows users to find branch locations in unfamiliar areas. If you’re a Dunkin’ regular, you’ll use this app often, although it would be more useful if it allowed customers to order ahead. Calorie Counter & Diet Tracker by MyFitnessPal: Allows users to find calorie counts, track consumption, and log exercise to reach their dieting and lifestyle goals. For users wanting to lose weight, this app takes the hassle out of working towards a challenging goal. Instagram: Lets users edit and share photos with followers and across other social networks, and see and comment on what others have posted. This app is a classic example of a social feed you’ll want to scroll through in an off-moment. Candy Crush Saga: Gives users something fun to do whenever they have a free moment. With close to seven million daily players, we can confidently say Candy Crush will be something you’ll want to play often (if you’re not already)! When crafting a mobile experience, marketers need to ask questions like a consumer. ‘What will I get when I tap your logo?’ ‘When will I want to tap?’ ‘Why does this app deserve a space on my phone?’ It’s crucial to consider how your app will fit into your target consumer’s life, and how it will continue to add value. If you create an app to answer a simple question that doesn’t arise often, for example, chances are users will download your app and delete. You need to build your app for engagement. The first step to avoiding the dreaded app graveyard is to design your app to fill a specific moment of need. Second, is to create a back and forth communication channel – but more on that in the next post.  Archived in Best Practices and tagged App design, Designing great apps. Bookmark the permalink.